With Índia, Gal Costa completely abandoned the absurd, screaming guitars and wild drumming for some of the lushest, most sophisticated, and most complex arrangements of her career. Her voice is clear and inviting as always, sitting perfectly with the strings, accordions, horns, reeds, and percussion that swirl around, effortlessly punctuating the romance in every track. With Gilberto Gil alongside on acoustic guitar and musical director, the arrangements definitely glow with his polyphonic personality, but these songs have a feel all their own -- sounding as if they blossomed out of necessity and the sharp edge of elegance. Índia seems as if it were conceived with ideas walled off to past influences and future aspirations, holding a timeless quality, leaving one to wonder if Costa and Gil were at all aware of what they were producing while it was happening or if they were completely swept up in the magic of the moment. Even though the hugely influential Tropicalia movement was over by the time of this release, Índia unquestionably shows that Costa's inventiveness was still unfolding and impulsive and should be considered by the wave of Tropicalia collectors as a worthy addition to the assortment of recordings in that it shows how a major player in that movement transferred her ambitions to a completely different direction without forsaking her class or drive. 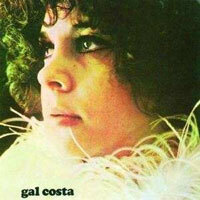 mehr von " Gal Costa"
Alaide Costa & Oscar Castro-Neves "Alaide Costa & Oscar Castro-Neves"